Justin Houston is a star linebacker for the Kansas City Chiefs who just received a massive contract extension, and yet he somehow remains a mystery. What drives him? This story appears in the Oct. 12, 2015, issue of Sports Illustrated. Subscribe to the magazine here. Let's start with the fire. 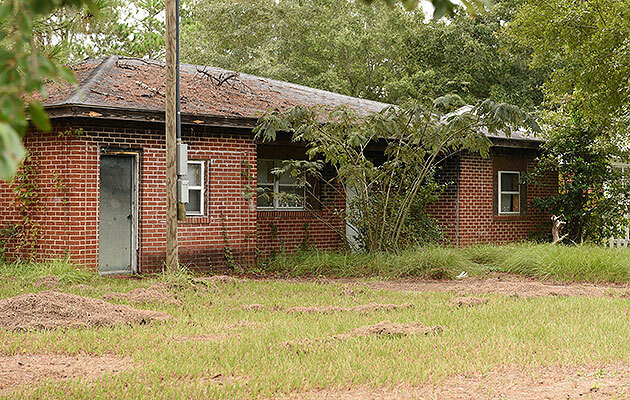 The day Justin Houston lost everything began like any other lazy Saturday at the two-bedroom house on Garfield Street in Statesboro, Ga. It was Oct. 25, 2003. Justin was in the ninth grade. That afternoon his mother, Kimberly, left him in charge of two younger brothers, and he sat them on her bed to watch cartoons so he could dial up a love interest. So he did. Justin sprinted back inside, fighting through the smoke and flames, and found his brothers, who were too scared to move. He shepherded them outside. The clothes on their backs were the family's only possessions that didn't burn. That record does not list a cause for the fire, but it finds that no “human factors” contributed. Houston says his family believes the blaze resulted from “some old wires in the ceiling” that sparked near the water heater on a wall in the other bedroom. The report estimates the damage at $45,000 for the residence and $15,000 for everything inside. Afterward local churches helped feed and clothe the Houstons while they found another place to live. The family of 10—besides Justin, Tylen and Aaron, Kimberly has nine other children, six of whom lived with her at the time—eventually settled into a house about 30 minutes outside of town. Statesboro High and its football teams helped as well, according to one of Houston’s childhood friends, Jon Knox. But little was said about Justin's heroics. That's the thing about Houston, the Chiefs linebacker who in July signed a new six-year, $101 million contract. “He rescued those little boys,” says Knox, yet he didn't seek any praise. He doesn't share that story with many outsiders. His teammates say they’ve never heard it. Houston says he never told them. After Houston’s childhood home burned, Statesboro rallied around his family. Ask any Kansas City player about Justin Houston and be ready for the look. Eyes downcast. Brow furrowed. REPORTER: [Justin and I] talked for an hour. DEE FORD, CHIEFS LINEBACKER: Really? REPORTER: I don't think the casual sports fan knows anything about him. REPORTER: Is he different in [the locker room]? FORD: Justin is Justin, man. FORD: That's a Justin thing. That’s between God and Justin. There should be a website called Justin Houston Facts, a hub for learning about one of the NFL’s great mysteries. Of note: Houston is married to a lawyer ... has a three-year-old son ... is expecting a daughter ... loves his Air Jordans ... bears a scar on his chest from a cyst he had removed as a child ... has a tattoo near the scar that says ONLY GOD CAN JUDGE ME. He’s a 6'3", 260-pound All-Pro with 52.5 sacks in 59 starts, but the only place he wants to stand out is on the football field. Houston enters a conference room at the Chiefs’ practice facility and folds his large frame into an office chair that wobbles under his bulk. ESPN's morning blabfest First Take plays on the television on the wall, but Houston pays no attention. He doesn't even look. Which is to say, the opposite. Late in the fourth quarter of his final outing last year, against the Chargers, Houston notched his fourth sack of the game and 22nd of the season. He stood half a takedown away from the NFL's single-season record, Michael Strahan’s 22.5 in 2001, but he was asked to drop into coverage on the last play of the game. He never complained, never begged for the chance to make history, an opportunity he might never have again. Statesboro is known for its university, Georgia Southern, and the fields of cotton, peanuts and corn that spread for miles outside the city limits. People go there to retire, Knox says, or they simply never leave. They hunt and farm, and they watch and play sports. The vibe is overalls and tractors. “It’s big enough that you can have some of the city opportunities, but small enough that you can hide and nobody knows where you are,” says Steve Pennington, Statesboro High’s football coach. His brother Demetrius, eight years older, was the nearest thing he had to a father figure. Demetrius pushed Justin into everything from sports to street fights. He demanded toughness. “He didn’t believe in raising no chumps,” Justin says of the second-oldest in his family. Justin is the family’s sixth oldest—smack in the middle—but an outlier when it comes to size. He’s larger than any of his siblings, including his twin brother, Jared, who was born a minute later. That mass was evident early on in hands that looked like oven mitts and in feet so big that Justin’s brothers and sisters called him Flipper. On Garfield Street, Justin recalls a life without privacy, a bathroom that never seemed free, a house that never went quiet. The siblings spent all their time together; the kids played hide-and-seek and video games and deemed the person with the most losses the Scrub of the Night. In his other sport, Houston started by wanting to emulate Emmitt Smith and Barry Sanders, to run away from contact rather than seek it. But from seventh grade, when he first played the sport, he was a defensive end—and from the first blow he delivered, he hit more like a man than a teenager. High school teammates called him Big Tomb, for the savage blows he delivered. But Houston had not fully grown into his frame, so he wasn't heavily recruited until after a state semifinal his junior year. That game, played at the Georgia Dome, pitted Statesboro against Griffin High and its future NFL running back, Bobby Rainey. Griffin ran away from Houston all day, but he stalked its backs across the field, and Rainey averaged only three yards a carry. Statesboro forced a fumble two yards from its end zone and made several fourth-down stops to win 7–0. The next weekend Houston and his teammates secured the state title. “Justin went from being this big dude, great athlete, to being basically the Incredible Hulk,” says Knox, a safety on that team. Urban Meyer, then at Florida, offered Houston a scholarship, but Houston wanted to stay closer to his family. Then Georgia coach Mark Richt paid a visit. He struggled that first year getting to classes on time (or at all), red-shirted, played sparingly as a freshman and was suspended for two games his sophomore season for violating team rules. He sometimes coasted during games, coaches say, relying on natural ability over technique. Houston welcomed the switch away from 4–3 defensive end. He still rushed the quarterback about 85% of the time, but now he did so from a more comfortable standing start, and he exploded even faster. Every morning he settled behind Grantham's desk, typed in the password his coach had given him and studied film—Ware and the Cowboys—until it was time for class. Whereas most NFL rush defenders relied on either speed or power, Houston saw Ware blending the two, making him one of the most feared defenders in the NFL. That winter, after ESPN draft analyst Mel Kiper Jr. tabbed Houston as college football’s top 3–4 ’backer prospect and the heir to Ware’s throne (Houston had 67 tackles, 10 sacks and 18.5 tackles for loss in 2010), Houston, citing his family’s needs, declared for the NFL draft. At the combine he wowed scouts with 30 bench-press reps at 225 pounds, a 36.5-inch vertical leap and a 10'5" broad jump. ​Richt would later say that Houston reminded him of another former Bulldog, receiver A.J. Green, in that he was both private and supremely gifted. But he was also, it appeared, still maturing. Houston tested positive for marijuana at the combine. That, paired with college tape that showed him at less than full effort (which Grantham admits was a problem at Georgia), sent Houston tumbling into the third round. Houston’s personality, his skill set and his versatility coalesced into a perfect fit for Kansas City. Chiefs fans are rabidly supportive but usually leave him alone when he dines out or hits the mall. He’s like them in that he defends one smoked-ribs joint above all others; in his case Jack Stack Barbecue. And in the Chiefs’ locker room—maybe the least flashy space in the glorified world of pro football—he's found teammates with similar mind-sets, who respect his space and privacy. Last season Kansas City suffered severely from injuries and health problems, starting with the Week 1 loss of two team leaders to IR and culminating in the Week 13 departure of All-Pro safety Eric Berry, Houston’s best friend on the team, for lymphoma treatments. (The Chiefs, according to Football Outsiders, had the NFL’s sixth-worst injury situation in 2014.) Houston visited Berry at the hospital roughly a dozen times (more than any other Kansas City player, according to various teammates), and in the end—reluctantly but at Reid's request—he stepped into the leadership void. Minutes after autographing his new contract on July 15, Houston settled on his first purchase. He didn't buy anything that might be considered stereotypical or lavish for a multimillionaire athlete. Instead he spent a few hundred dollars on the only thing he really wanted: a plane ticket back to Georgia. News of the deal’s consummation had reached Houston near the end of yet another workout. He finished 45 minutes of abdominal torture, flew from Atlanta to Kansas City, tried to sleep, failed, drove to team headquarters, passed a physical and signed a stack of papers an inch thick. Next stop: the airport, for a return trip. On board he turned his head away from his fellow passengers, focusing on the farms spread below the window. Even if his tears were joyful, he didn't want anyone to see them. Three hours later he pulled into his mother’s driveway and met her and his grandmother at the door. They didn’t talk for 10, maybe 20 minutes; they just hugged and cried. Then they retreated to the garage and told stories for hours: stories about siblings and sports and the ultimate middle child. Houston is now known in Georgia and Missouri and, to some extent, across the country. Yet only a handful of people really know much about him. On the way to one of his sacks against the Broncos, TV cameras captured his face. He was smiling. And that better summarizes his thoughts on the 2015 season than anything he could say. Or would say. His siblings are older now, deep into their own lives. Demetrius owns a barbershop in Statesboro. Another brother runs a cleaning business. One sister is going back to school to get her master’s degree. Others are in high school or college. The youngest Houston is in eighth grade. Justin gives them all the same gift each Christmas: new shoes. As he wrapped up his visit, he hugged his mother and grandmother one last time and shared a final surprise that he'd saved for the end. He had purchased two plots of land next to each other in Statesboro, and there he planned to build a house for each of the women: marble kitchens, hardwood floors, everything designed to their specifications—whatever they want. That gesture will say what Houston cannot express in words. He will replace what his family lost. He will show how far they’ve come.